This page updated 19th September 2013. RTL allocations did not stay static, of course. 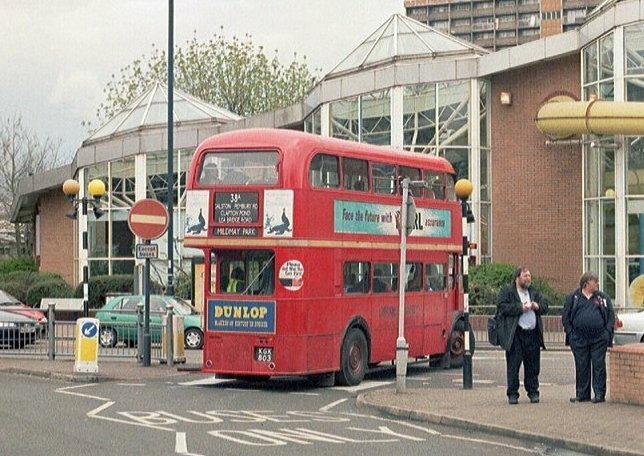 Individual buses moved around at overhaul, and every now and then service revisions would require whole garage-fulls to swap locations with RTs, in an effort to keep garages having only the one type or the other (Upton Park was unusual in having RTs, RTLs and RTWs simultaneously). In early 1958 services in general were cut back. About fifty of the lowest-numbered RTLs were sold to Bird's Commercial Motors in Stratford-upon-Avon in early 1958, and were snapped up by independent operators throughout the UK. 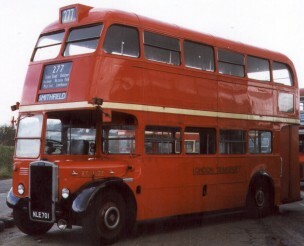 The two-month 1958 dispute saw a large fall in the number of passengers - and staff, and subsequently the end of various routes and some garage closures. After the dispute, with RTL routes hit hard by closures, a huge number of RTLs was put into store, with Clapham (an all-RTL shed )and Putney Bridge (RTL/RTW) closed totally, and Upton Park, Barking and Seven Kings converted to RT. Forty-seven RTLs were sold en masse in December 1958 alone for use in Ceylon. 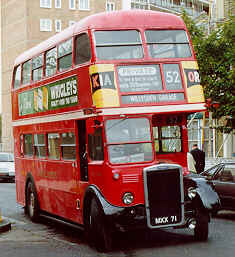 The trolleybus replacement programme was originally supposed to use RMs as the new replacements. But there were massive numbers of buses in store. Stage One used RTs. 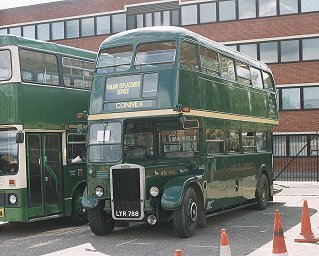 The second stage of the trolleybus programme in April 1959 saw the use of RTLs, which took them into Clapton (CT), Bow (BW) depots in place of trolleys, and also into Leyton, T. These RTLs nearly all came from storage. 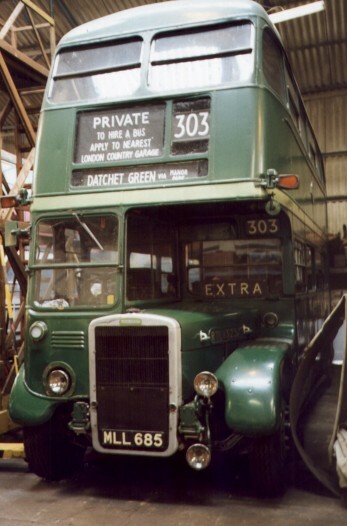 Route 38A used RTLs fom Clapton Garage. 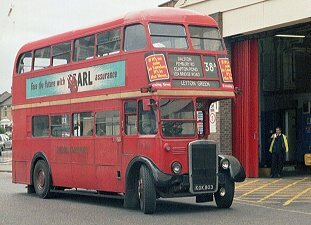 Here is RTL139 looking good at Leyton Garage on the Hackney Running Day at Easter 2006. RTLs also featured directly or indirectly in later conversions. Victoria - an RT garage - surrendered its RTs in July/August 1959 for use in Stage3 of the trolleybus displacement, receiving RTLs in their place from around the fleet. Bow received more RTLs from store for its further conversion. Stage Four in November saw trolleybuses replaced by the long-awaited RMs. But those included some that had been on trials at various garages. These were replaced by RTWs, which came from Walworth, which received extra RTLs in their place. 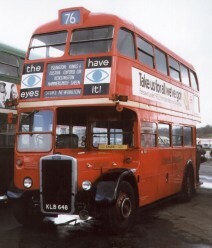 Clay Hall garage - an RTL shed - closed, with its buses dispersed. 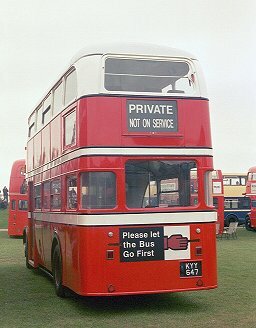 But it was not long before London Transport began to sell surplus RT-type buses, and the slightly non-standard RTLs were fairly high on the priority list, after the roofbox RTs. 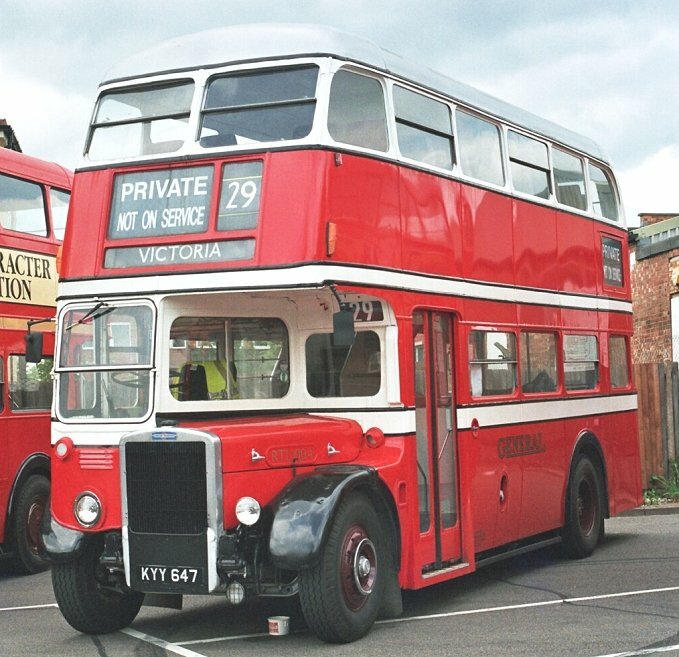 They had not proved particularly popular compared with RTs, being considered heavier to drive and noisier (See the comparative drive test of a preserved RT and RTL in Classic Bus 13). RTL1256 on Railway Replacement Service at Sidcup Station, 2002. Photo by Ian Smith. Click for larger picture. In January 1952 six brand new red RTLs had been sent to the Country Area, scattered to Guildford (1250), Hertford (1252), Northfleet (1256), Reigate (1258), Tring (1259) and Hatfield (1276). This was a response to the Country Area's continuing need to displace the last STLs, plus the hiccup in the smooth programme of replacement caused by the takeover at Grays. But more green RTs arrived during January, and by the end of the month the RTLs had all been sent to the Central Area. But the Country Area did not escape from RTLs entirely. 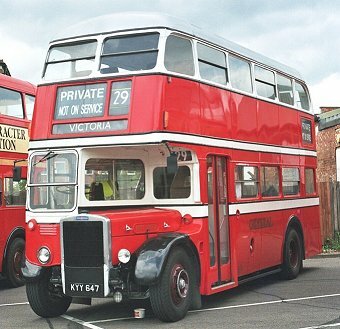 It was common in the early fifties for Central Area garages to loan buses to the Country Area for Summer Sundays - the Country Area's busiest days! So RTLs, in red, were often seen on Sunday Country services. In July 1959 things went a bit further. In order to assemble enough green RTs for the summer Greenline extras, mainly to Windsor, a dozen RTs were transferred out of Northfleet garage, and their place taken by sixteen red RTLs. (RTL660, 703, 852, 994, 1093, 1238, 1245, 1248, 1253, 1259, 1276, 1303, 1409, 1477 and 1498, with 914 in August). They were used on the Northfleet local routes, for some weeks, trickling back to the Central Area in August and September. Somebody must have thought this was a good idea, for in September and October 1959 eighteen RTLs were painted green at overhaul. (RTLs 1245, 1256, 1258, 1262, 1264, 1265, 1266, 1268, 1273, 1275, 1276, 1277, 1278, 1285, 1290 1297, 1300 and 1311). Country Area (or the Unions) must have been less enthusiastic, for all eighteen went into store at Stevenage and Grays for the winter. In July 1960 they were allocated to Hatfield, and appeared on that garages network of routes, notably the 303/A, 324, 340B and 341, which took them to Hertford, Stevenage, St Albans, Hitchin, Welwyn Garden City, Hatfield... But they were not popular with crews and maintenance staffs used to RTs, and after eleven months they were replaced by repainted RTs from the Central Area. Central received most of them back and scattered them across the system, still green, as trainers. (The exception went to Garston as a staff bus). 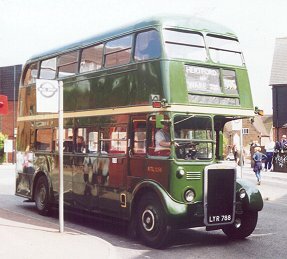 RTL1256, then privately preserved, visited the running day at Hertford in June 2001, and worked a stint on the 395. During the 1960s disposals of RTLs continued. Twenty-three were given older RT10 roof-box bodies at overhaul during 1964, whilst over fifty that had received late-build RT8/2 bodies were called into Aldenham during 1965 for body-swaps out of normal overhaul sequence and given older RT8 or RT3/1 bodies that had not been overhauled. They returned to garages (unlicensed) for mechanical parts replacement before later sale to overseas buyers. RTL453 and RTL1427 at Cobham Open Day April 1998. Photos by Ian Smith. Click for larger version. The RTLs were displaced by RMs from the central garages where they had clustered, and also by RTs as they in turn were RM-displaced. Many RTLs were sold abroad: Ceylon (now Sri Lanka) took 728 between 1958 and 1968! 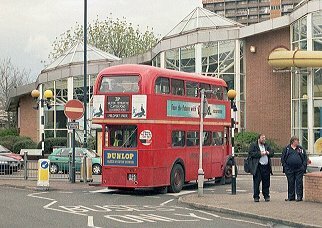 Others ended up with independent bus companies in the UK, such as A1, Barton, Stevensons and OK. Walsall Corporation had some. 14 went to Jersey, providing holiday transport on the Channel Island. The last was withdrawn from public service by LT in November 1968, when the 176 and 226 (AC) became RT operated. RTL1512, followed by RTL543, were the last two in service. The RTs were welcomed as they had " ..quieter braking - lighter steering - softer engine sound - BUT - oh JOY!!! Cab heaters!!!!" to quote a driver receiving the new buses. Quite why the cab heaters fitted to the RTLs had not impressed him I don't know! A few continued until 1970 as staff transports, and as trainers. RTL1004 was heavily converted in Jersey with a forward entrance and staircase. It is now preserved in the UK. Please let me know if you know of others. South Africa for weekly hotel duties. RTL 1264          1998  in S.africa, engineless: body going to RT222. RTL1348 outside U, Upton Park Garage. Photo, used with permission, by BusSpotter. RTL1323 in preservation, Cobham Museum.